Rapper Rick Ross has reportedly suffered a second medical emergency on a plane Friday while travelling to Memphis to perform at a college basketball kickoff. The Miami-based artist's private jet to Tennessee was forced to land in Birmingham, Alabama when he suffered a seizure, according to reports. The incident happened just hours after Ross suffered a medical emergency on board a flight from Fort Lauderdale to Memphis, prompting the pilot to return to Fort Lauderdale-Hollywood International Airport, reports the Associated Press. Hours later, Ross tweeted "Memphis here I come", and posted a video of himself aboard a private jet, promoting his upcoming album and an appearance at a Wing Stop restaurant. "There was a private plane that was routed here for medical purposes," a representative of Birmingham-Shuttlesworth Airport confirmed to E! Online. The rapper's health first made news Friday morning when Delta Airlines flight 1310 reported a medical emergency shortly after its 12:21 p.m. takeoff and returned to the airport, confirmed Broward County Aviation spokesman Greg Meyer. Broward Fire Rescue officials said an adult male was treated with "advanced life-support care," on scene and was transported to Broward General Medical center. NiteCap: DJ Khaled: "It's Rick Ross' Time"
Unconfirmed reports suggested the Carol City native -- real name William Leonard Roberts II -- suffered a seizure, but friends shortly took to Twitter to confirm Ross was stable. "I just talked to Ross," tweeted rapper Wale. "He's 100 percent okay." 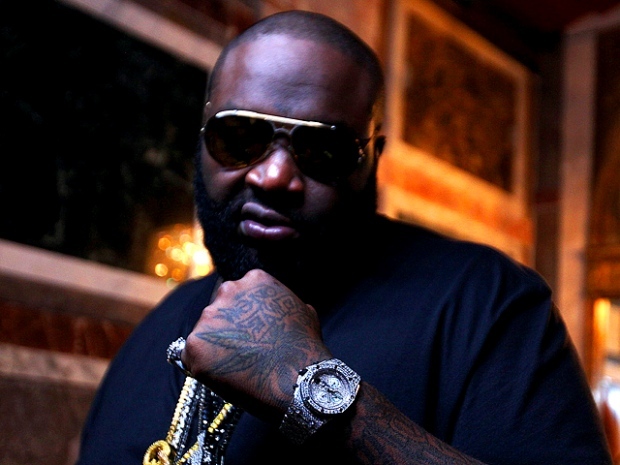 "Yo [Rick Ross] is straight," messaged artist Meek Mill, who is signed to Ross' Maybach Music Group label. Ross and members of his label were expected in Memphis Friday night to perform at the University of Memphis' men's basketball kickoff event, Memphis Madness. Rapper Yo Gotti was asked to perform solo in his place, reports WHBQ-TV in Memphis. "No mention of Rick Ross yet," tweeted sports blogger Kevin Cerrito from Memphis Madness. "It's like on Saved By the Bell when they never mention Kelly or Jessie during the Tori episodes." Friday morning, Ross tweeted his excitement about the weekend. "Headed to Memphis," he wrote. "M-Town will be on fire tonight with the Boss and UofM Memphis Madness."